I finally got to read this book! I have been waiting forever for Goddess and I am so happy it is finally here! The Starcrossed series is one of my favorite reads- I love the soapy drama, the action, and most of all the Greek Mythology. This book did not disappoint. I think what I love most about this book is how time weaves together to make a complete story- we are shown the complete story of Helen of Troy and some of the lifetimes she has lived through. I found all of the memories fascinating. I loved seeing how each character in present day was a recreation of the original characters of the Greek tragedy. The action in this book is pretty much non-stop. The fighting, the super powers, it is all relentless. I often hear people talk about action movies with the phrase "pulse-pounding action". Pulse pounding action fits this story completely. The author is at her best when she writes fighting scenes. They are written so well I have no trouble imagining each fight and picturing each character in detail. Did this story go the way I expected it to? No. Are some parts of the storyline convenient? Yes. Do I care? Heck no. I am completely sold on these characters, the story, and what the author had in mind. I was broken by the characters (spoiler alert) that died in this book and I found myself absolutely invested in all of their lives. 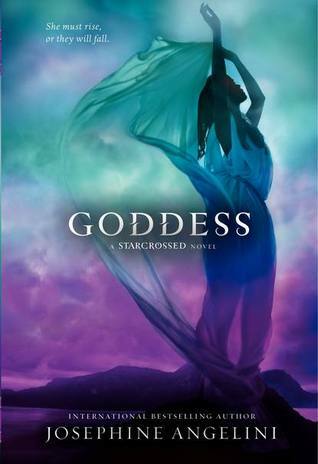 Goddess will be a satisfying ending for all of the fans of the Starcrossed series. I am so sad to see this series end, but I absolutely can't wait to see what this author has next! Dropped by today ! This sounds like a really interesting read.Followed all your social links & bloglovin networkedblogs, google friends connect.Happy Reading ! My mom and I loved the first two books and I can't wait to read the finale! Great insight.